The next day, we woke up early and headed right out to the Great Outdoors buffet for breakfast. We wanted to get an early start because this was the day we were supposed to spend at Great Stirrup Cay, Norwegian’s private island. The plan was to get the first tender out so that we could make the most of our time, as this was the port we were most looking forward to. After we ate, we stopped by our room quickly to pick up our bags (we were bringing our snorkels, masks and fins to port so we wouldn’t have to rent them). While we were there, they made an announcement that due to unsafe water conditions, they would be cancelling Great Stirrup Cay since it was too rough to tender over. This was definitely a bummer since we’d been excited to explore this island, but at the same time we appreciated the fact that they were putting our safety first. When we were eating our breakfast, J had noticed that the seas were a bit rough. When the announcement was made, J grabbed our towels and headed right up to to the pool deck to secure some lounge chairs before it got too busy. Quick Tip: If a port day turns into a seas day unexpectedly and you’re still wanting to enjoy the pool, I encourage you to reserve some chairs ASAP because the deck fills up pretty fast, especially on a smaller ship like the Sky. After quickly unpacking our snorkel gear, I made my way up to the pool deck as well. At first it was difficult to enjoy the beautiful sunny day because the ship was moving really fast and it caused the winds to be super strong. This only lasted about an hour and then they slowed the ship down and the high winds turned into a comfortable breeze. We killed that hour by having second breakfast at the buffet (because why not?). Once the winds died down, it really was a beautiful day. We enjoyed the pools and the sun. The people next to us were a group of volunteer fire fighters and their families from the Chicago area. They were super friendly and we had a fun time getting to know them and chatting throughout the day. See how packed it got? Thank goodness Mr. F had the foresight to get up there and reserve our seats early! For lunch, they had a big buffet BBQ right next to the pool. I especially loved the ribs that were available (and the big bowl of olives that J grabbed from the buffet and surprised me with- he’s the best!). I also enjoyed a virgin peach daiquiri that afternoon which was extra delicious! They handed out complimentary rum punch to try and make up for not having a port day. J grabbed a ton of those and was stashing them under his lounge chair. I actually grabbed a few for him as well (I’m sure the waiter was totally judging me for grabbing cocktails with my obviously pregnant belly on display). For the record, I didn’t drink any of them, I was just getting them for J. I don’t think the staff really cared about the stash of drinks that was under J’s chair though, everyone was hording these. A Virgin Peach Daiquiri by the pool! We were told that there was pub food in the buffet during late afternoon and it sounded really great but we opted out to save room for dinner. Instead, we headed in to get ready for our dinner that night. We got a lot of sun that day and while we regretted not getting to explore Great Stirrup Cay, who can complain about such a gorgeous pool day? Apparently a lot of people, as we were told that a lot of people were flipping out at the poor crew working the guest services desk. J and I instead decided to make the best of it and enjoyed the beautiful day that we were given. Our dinner that night was at Cagney’s once again. We could have gone to Il Adagio, but we live in a part of the country that has such excellent Italian food, not to mention that we’re part of a family that al;so makes such delicious Italian food that we figured we’d splurge and enjoy more steak! 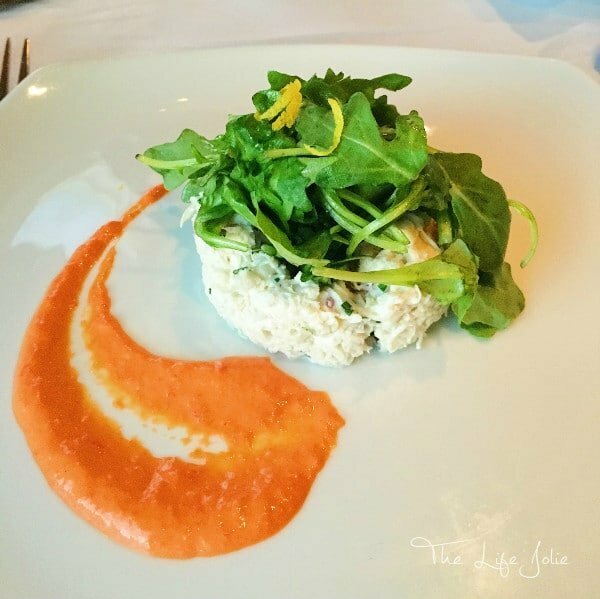 I started with the Lump Crab Salad with a Red Pepper Coulis, which was absolutely fresh and amazing! Seriously, I want to eat this again and again! J began with the Loaded Baked Potato Soup, which he seemed to enjoy. This time I opted for the 18 oz. Bone-in Ribeye (which came out the perfect medium rare!) with the most incredible Green Peppercorn Sauce as recommended by our server and J once again enjoyed a 32 oz. Porterhouse. His came out under what he was hoping for (we generally like our steaks pretty rare but this was definitely more rare than we even like). They had no problem taking it back and when it was returned the temperature was perfect for him. For sides we had mashed potatoes, mac and cheese (not J’s favorite), a baked potato, broccoli and green beans. I know, we’re total fatties. Dessert was my usual Raspberry Creme Brulee and this brownie with toffee and ice cream that was pretty amazing! The service was once again awesome and all the staff was so very friendly and gracious! After dinner we walked around for a bit and then headed back to our room to pack and get some rest. My breakfast before we got off the ship! After we ate we headed back to our room to grab our bags and then headed down to disembark. Quick Tip: Norwegian has two options for disembarkation: you can leave your bags outside of your door the night before and get a time assigned for you to disembark or you can walk your bags off by yourself which is faster. We opted for the second option as we had a car rental to pick up at 8am to give us a little freedom in Fort Lauderdale before our 3pm flight. Quick Tip: To disembark you’ll need your passports, your bags and a declaration document that they leave in your room the night before your leave where you indicate what items you’re bringing back into the USA. Please note you only need one for your family. It’s super helpful to have all of your papers together before you get into line as everyone just wants to get off without being held up. We found the disembarkation process to be pretty quick and easy. They had a table right there full of confiscated goods (like booze and other things) that people were getting back. Once we were off we went through customs in the cruise terminal which was a bit of a line but it went really fast and then we headed outside to get our shuttle to the rental car terminal. This is where the day turned into a bit of a hellish travel ordeal. Without going into too much details, it was a comedy of errors involving horrible cab driver, long lines, way more walking than there should have been, many delays, dehydration and some pretty rude fellow passengers. But the important thing is we got home safely. While it was a bit of a chilly home coming, we were thrilled to be sleeping in our own bed and to see our sweet girl! November 16, 2015 at 11:28 am Yes, nothing beats your own bed. To be honest, I only made my way into the pool once that day to cool off. I'm also not a fan of crowds but I am a lover of the ocean (especially since it's not so accessible where we live). I cannot wait for the next cruise! 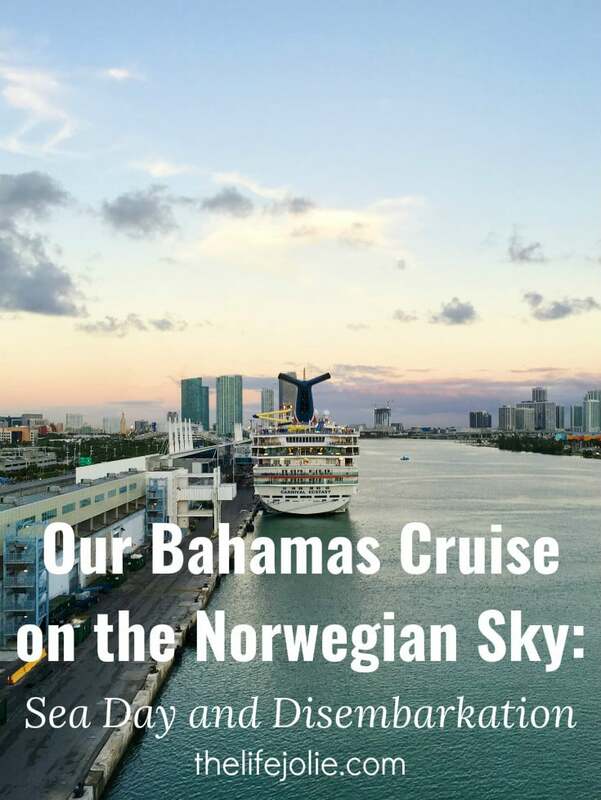 November 13, 2015 at 6:45 pm I am also planning for Bahamas Cruise in few months. Thanks for sharing and am so glad that you had a great time. November 16, 2015 at 11:26 am I hope you have a great time- it's really a beautiful trip to take!